Gozinaki is a New Year's dessert. Obviously, you can prepare it any other time of the year, but it never tastes as good as on December 31. Even though originating from Kakheti, Gozinaki is made in all sorts of ways. Of course, there is a classic recipe, but let's drop it for now. Let me introduce an experiment, which will make your New Year's table twice more festive. Warning: people will start discussing your creation, your mother-in-law will most likely hate it, friends will love and the neighbors will ask for the recipe… so, get ready for the very special New Year's party. First of all start gathering the ingredients. My advice is to buy everything few weeks before, as otherwise, you know you will have to pay double on your pre-holiday shopping rush. Apart from walnuts, you'll need some sunflower seeds, nutmeg, almonds, and hazelnut. What an amazing bouquet, isn’t it? Frying almond takes more time than any other ingredient, so start with putting unshelled almond seeds in the oven and control the temperature. As soon as it's done peel the fried seeds and continue the same procedure with the rest of the ingredients. Meanwhile start boiling honey in a thick-bottomed pan. 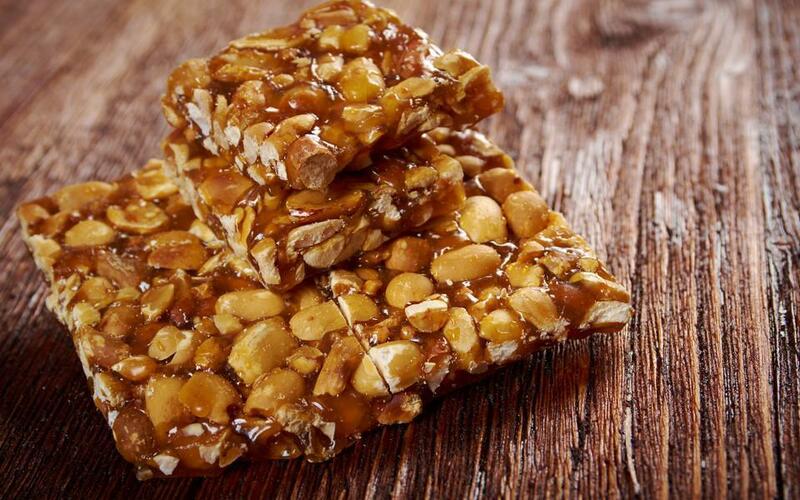 Add few spoonful of sugar which will take on honey's absorbing ability and will make Gozinaki crunchy. That's actually a matter of taste. When the honey starts boiling, throw all sorts of ingredients into it and boil once again. The most uninteresting procedure is taking the Gozinaki mixture out from the pan, rolling it on a wet board and cutting it into rhombs. Though, do not complain too much - the result will be fantastic.